The second round of the ST Trophy was the Malcolm Wilson Rally based in the forests around Cumbria. The Rally HQ and start were based at M-Sport, the home of the Ford WRC team. 7 crews had ventured to the most northerly round of the championship and the weekend kicked off with a tour of the M-Sport workshops for registered ST Trophy crews. Drama started early for one crew at the Cockermouth town centre scrutiny area. The master cylinder on Mathew Baddeley & Phil Kenny's car started leaking fluid into the car from the clutch pedal. The team tried to sort the problem, Mat & Phil even rushing to a local motor factors to find a replacement part but after further inspection decided to throw in the towel and have a day spectating instead. The weather was going to play an interesting part in the event, heavy rain on the Friday would make the going tough and with overnight temperatures dropping there was a fear of ice. Saturday dawned to snow on the high ground but the temperature was rising so the ice fear was quashed but slushy conditions were going to make the early stages very slippery. Zak Hughes & Tom Wood were the highest seeded ST crew. As championship leaders they had a target on their backs, and they were going to have to push hard to keep that yellow 'leader' sun strip. The crew went out strong in stage 1 but sadly an overshoot lost them around 10 seconds. Stage 2 was so slippery, and with over a dozen cars retiring in that stage, Hughes decided to be sensible and just get round the 5 miles and keep their nose clean. Stage 3 in Greystoke had better conditions and Hughes pushed hard and topped the time sheets but were in 2nd place heading into the first service, just 3 seconds behind the leaders. Bobby Mitchell & Shannon Turbull were keen to show 'what could have been' on the opening round in Wales, punctures scuppering any hopes of challenging Hughes for the win there. Mitchell meant business here in Cumbria and came out of the opening 2.6 mile test with a 4 second lead. Unfortunately they were held up in stage 2 by a slower car ahead, the crew not seeing Mitchell & Turbull, so they were forced to follow at a reduced pace for quite a distance. They were then 3 seconds slower than the charging Hughes on stage 3 but still came into service as the leading ST crew. Third crew away were the Irish crew of David Kelly & Gerry Hughes. David had been doing some testing to gain experience of gravel and the car, this being only Kelly's second forest event, however David is no slouch in his native Ireland on the tarmac so only time will tell until he is up to speed on the gravel. They were quick out of the blocks and were only hampered on stage 1 went they caught a slower car but on the short stage this didn't cause too many problems and they matched Zak & Tom's time. A clean run through the treacherous stage 2 with a joint fastest time with Mitchell saw them 2nd overall heading to stage 3, Greystoke. With Mitchell & Hughes battling hard now, Kelly dropped some time over the 6.5 mile M-Sport test track, maybe the lack of gravel experience the cause, but lying in 3rd place at service was something to be very pleased with. Elliott Stafford & Lewis Sim wanted to make up for their troubled first round so headed into the first group of stages with high hopes, however, a rear puncture on stage 2 slowed them slightly & trouble with the car starting caused them a few worries. They kept going and a clean run through Greystoke stopping the clock just 1 second behind Kelly saw them go into service in 4th place just over a minute down on the leaders. Steven Ormond-Smith had made the trip over from the Isle Of Man, this was his first showing in the championship, unfortunately missing the first round due to work commitments. Like Kelly, he was more used to tarmac so the early slushy conditions were going to be a big eye opener for the Manx man. With Max Freeman calling the notes they kept their noses clean through the first 3 stages and came into service in 5th place with no problems to report. Wesley Gilford returned to the ST Trophy again this year, he is again the only registered competitor using the RF2.0 clubman version of the car. 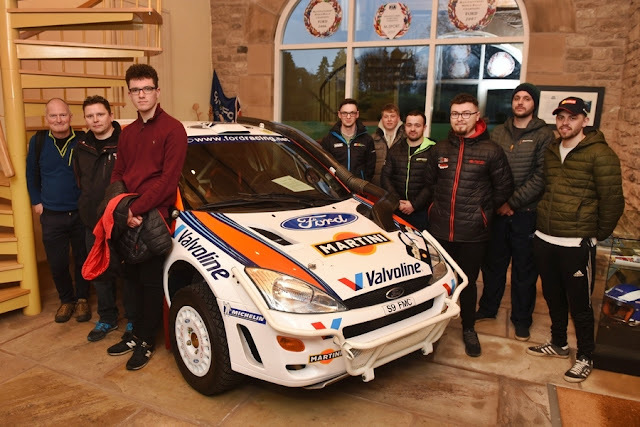 Wesley was joined by Mark Townson for this event and the crew had an early start with the RF cars running at the front of the field and in reverse order, Gilford & Townson actually being the 3rd car on the road so the conditions of the first 2 stages being extremely tricky. The crew made it to service but would retire on the road section out to stage 4 with an under powered engine & an electrical gremlin. Four more stages greeted the crews before a second service back at Penrith. The first 2 short stages were identical and the crews looped round to repeat it which caused inevitable holds ups. Hughes dug deep and pushed hard through stage 4 beating Mitchell by 12 seconds and taking the lead. Stafford had a good run and was only 1 second behind Mitchell, Bobby confessing he had been caught napping after the long delay. Kelly started to suffer with a misfire and the car finally crying enough after the stage with an upset coil pack. Ormond-Smith was continuing to gain experience and kept heading in the right direction, now up to 4th with Stafford being promoted to 3rd with the demise of Kelly. After stage 5 the crews headed to the longest stage of the day, the 12 mile Grizedale. With Hughes & Wood holding a 17 second lead over Mitchell & Turnbull they had a little bit of breathing space. Hughes again topped the time sheets but only 1 second quicker than Mitchell who had now woken up! Mitchell admitting he was going to have to settle for 2nd again if Hughes kept up his current speed. Sadly the fight wouldn't continue as Bobby found a leaking fuel rail at service 2 so was forced to retire. Steven Ormond-Smith was given a notional time and was shown as 3rd quickest through the stage with Stafford having a nightmare with punctures which then caused him to retire on the road section back to service. Only two crews tackled the final stage back at Greystoke. Zak Hughes & Steven Ormond-Smith. They then headed the short distance back to the finish ramp at Penrith. Hughes & Wood overjoyed with their 2nd win of the season and impressively they had also come home 2nd overall in the BTRDA silverstar category for 2WD cars. Ormond-Smith & Freeman ware pleased to bag valuable points for the championship and gain experience on the gravel. The next round is the Rallynuts stages in April. Keep up to date with all ST Trophy info on our facebook page and on twitter & instagram. The 2019 MRF ST Trophy got underway at the Cambrian Rally based in North Wales. 7 of the 11 registered crews made their way to a surprisingly sunny Llandudno. 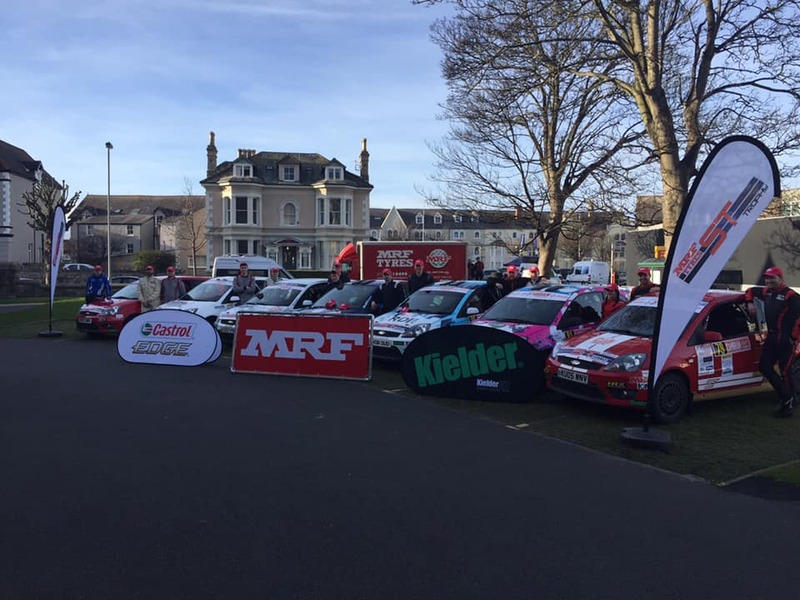 The event was also round 1 of the BRC so the organisers had put on a spectacle which included town centre servicing for the crews. Bobby Mitchell & Shannon Turnbull led the crews away and immediately struggled with brake issues in the first couple of stages. Not knowing if it was the car or the conditions causing the issues. Their plan coming into the event had been to push hard from the word go, but with the brake issues they opted for a more conservative approach but still arrived at the Llandudno town centre service with a 7 second lead. Zak Hughes & Tom Wood returned to the ST Trophy for a second season. Last year they were always setting the pace but a catalogue of mechanical woes put them out of any championship contention. With a fully refreshed car they headed out to the stages in a confident mood but like Bobby they suffered brake issues in the slippery opening stages. After Zak realised he had been turning the bias valve the wrong way he managed to settle into a nice rhythm and topped the time sheets on a couple of stages and were looking forward to a battle with Mitchell & Turnbull in the afternoon. David Kelly & Kenny Bustard had made the long trek over from Ireland, arriving just in time to get the car passed through scrutiny. This was to be David's first time on the gravel, only ever doing asphalt events over on the emerald isle. The first couple of stages were taken with caution but they soon settled into a good pace and reported no issues at service and in a comfortable 5th place. Rhydian Price was another returnee to the championship, he had the world famous Steven 'Doc' Brown in the passenger seat, the pair had teamed up last year in the Welsh championship to good effect. Sadly their first event back wasn't going to bare the fruit they had wished for, a spin on stage 1 with a costly three point turn followed by a snapped shaft on stage 3 which sidelined the likeable duo. Matt Baddeley had Phil Kenny on the notes, Phil is a regular co-driver in the ST championship so Matt was in good hand. The plan for the event was to get miles under their belt and get used to the new car. With no issues at service they were happy with their progress and they were in 6th place. Will Corey & Brynmor Pierce set a good pace from the word go, Will actually driving Brynmor's car so a little pressure on to make sure the car stayed in one piece. Will was settling in nicely to the car and was at the sharp end of the leader board through the morning loop coming into service in 3rd place. Elliott Stafford & Lewis Sim, another new pair to the championship were on a learning curve, getting to know the car and the stages. They were struggling with overheating issues at first service, the mechanics stripping the front of the car trying to solve the issue. They were laying in 4th place at this point. 6 cars set pout from service to tackle the remaining 4 stages. Bobby still led after stage 4 but Hughes had been pushing hard and Mitchell's lead was now less than a second. Corry was still in 3rd and was happy with his pace, Stafford had started to have gearbox issues and the car was still struggling with the overheating issue and had begun to cut out so he was overhauled by Kelly. Stage 5 was a disaster for the leading crew of Mitchell & Turnbull. They started the stage on a rapidly deflating rear tyre. Having been told on the start line that they had to change it in the stage the crew took a tactical decision to run the 4 miles on the flat hoping to lose less time than stopping to change. They then suffered a 2nd rear puncture and had to limp through in a very sideways style. Zak & Tom had seen Bobby set off with the soft tyre and they knew the Scottish crew would struggle so suddenly the pressure was off. They knew just a clean run through the final stages would give them victory. Will & Brynmor had closed the gap to 2nd place with Bobby's puncture problems and were only 6 seconds behind going into the last stage, Mitchell now out of tyres was going to have to play it cool to keep the 2nd place. Stage 6 would be the last we would see of Stafford & Sim, the car causing too many issues to continue. Kelly now in 4th & Baddeley in 5th were having trouble free runs just getting used to their new cars, Kelly, with no lamp pod was a little nervous of the diminishing light going into the final stage but all was good. Zak Hughes & Tom Wood returned to the finish ramp on Mostyn St in Llandudno in 1st place, Bobby Mitchell & Shannon Turnbull held on to a well deserved 2nd place with Will Corry & Brynmor Pierce taking 3rd place after a clean run. 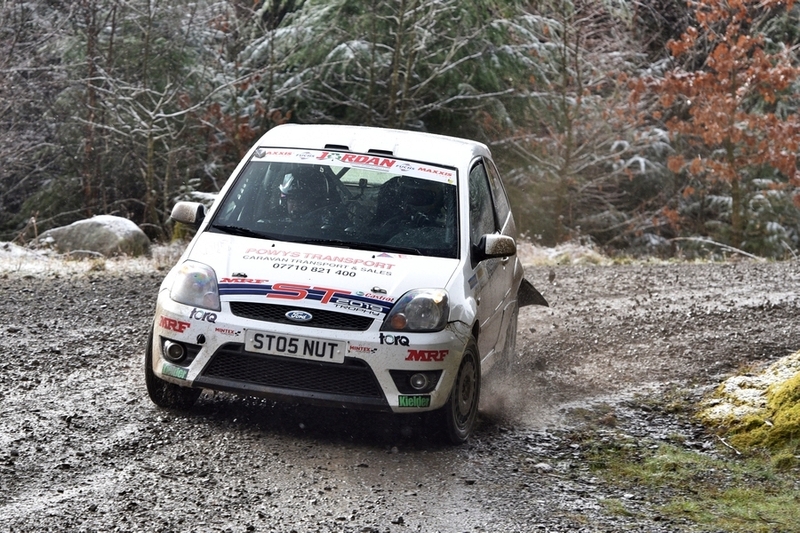 The crews make their way to the Lake District next for the Malcolm Wilson Rally on 9th March. To keep up to date with everything ST Trophy find us on Facebook, Twitter & Instagram. A representative from the ST Trophy will be at the show on Saturday 12th January.